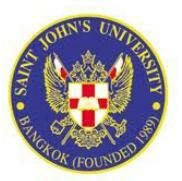 St. John’s University was initially granted a college status by the Ministry of University Affairs on January 5,1989. On March 19, 1996, it was granted a university status to provide bachelor degree programs under the supervision of the Ministry of University Affairs. The University resolves to create individuals with virtues and knowledge as clearly illustrated in the university’s motto: “Virtus Sola Nobilitat”, which means “Only virtues can make human beings honorable”. Presently, there are five Faculties in St. John’s University: Faculty of Business Administration, Faculty of Communication Arts, Faculty of Liberal Arts, Faculty of Law, and Faculty of Engineering. The University has impressive facilities. There is a library, which has more than 45,000 textbooks, catalogues, references, periodicals, and CD-ROMs. There are three computer labs and a students’ Self-Access Center equipped with more than 100 computers. There is a clinic for students’ health care and recreation. There are basketball, volleyball, badminton courts and facilities for table tennis. There is a bookstore where reading materials and stationary are available. St. John’s University has a very convenient location-right in the heart of the city. It is accessible by all kinds of public transports – bus, taxi, motor vehicle, etc, a subway station (MRT) which is just a walking distance away and a sky–train station (BTS) which is only 5 minute taxi ride from Phahonyothin and Ladprao. There are countless condominiums and apartment buildings, shopping malls, wet markets, convenient stores, etc. in the immediate surrounds. Faculty of Philosophy and Religion.